SEUTTER -XVII Provincia Belgii five Germanie Inferioris. SEUTTER, M. - XVII Provincia Belgii five Germanie Inferioris. XVII Provincia Belgii five Germanie Inferioris. - SEUTTER, M.
Title : XVII Provincia Belgii five Germanie Inferioris.. Size : 20.5 x 24.0 inches. / 52.0 x 61.0 cm. 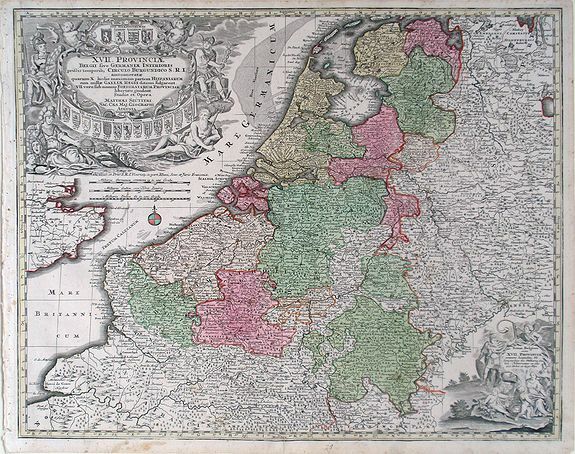 Description :Matthaus Seutter map showing regions of northern France, Belgium, Holland, England and Germany. Condition : Two small repaired tears on bottom paper edge. Minor discoloration throughout on paper margin. Wear on the left margin from where the map was bound.